Kampala the Capital City of Uganda has a modern set of premier hotels offering first-class accommodation services to visitors on safari tour to Uganda’s Capital city. Among the many hotels, lodges in Kampala, Hotel African set just 3 minutes’ walk from the city Center, is the only premier hotel where visitors on Uganda safaris should opt to spend night while on their stay in Kampala. The hotel is set in a serene location offering panoramic views of the city skyline and surrounding hilltops. With total of 233 rooms distributed as 5 suites, 103 deluxe rooms and 117 twin bed rooms and 8 Apartments, Hotel African offers wonderful accommodation facilities at fordable prices. Just to note, all the rooms at the hotel are fully equipped with an individually controlled air condition system, attached with a full private bathroom, a balcony overseeing the spectacular view, satellite television, fridge, wire and wireless internet access. The hotel rooms are designed in this way mainly to ensure that visitors on Uganda safaris enjoy their stay in Kampala. 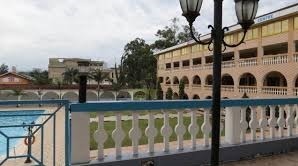 The hotel consists of Restaurant with a seating space of 120 people, fully air-conditioned, well-furnished and ideal venue for dinners and medium-scale wedding receptions. There is a wide choice of tasty dishes ranging from western and traditional African delicacies to oriental. These dishes are served to visitors under splendid atmosphere. At the Coffee shop visitors on safaris in Uganda can enjoy a hot beverage and sample a flavorful variety of snacks and pastries 24 Hours a day. In regard to conference and events facilities, the hotel has over 14 fully furnished well air-conditioned conference halls with seating capacities ranging from 20 – 3000 participants. The conference rooms are Internet ready with a dedicated high speed wireless connection to the internet and other features in the conference rooms Include Writing pads, flip charts, pens & pencils, overhead projector, internet services, printing & typing services, faxing & binding and much more. For visitors interested in health fitness services, Hotel Africana boasts of its modern health club comprising of sauna, massage, steam bath, gym and aerobics and all visitors on safaris to Uganda while staying at the hotel are entitled to free access to health facilities apart from massage. The hotel gym equipment is ideal for everyone’s health fitness and the professional instructors ensure you receive total workout satisfaction.